Fall 1862 — Following her husband’s tragic death, young widow Abby Butterfield Browett’s first responsibility is to her son. Her desire to provide a secure future for her child has led her to accept a proposal of marriage from Isaac, a man twice her age. In her heart, she knows that Isaac lacks the fire and zest for life that defines Abby, but her son will be cared for. Can she be happy with only that? Despite her reservations, Abby joins her fiancé on the journey to the Endowment House in Salt Lake City, unprepared for the challenges that begin soon after they embark. When their trouble turns dangerous, it is a group of rough frontiersmen that come to their aid. The incident provides Abby the excuse she needs to turn back and postpone the wedding—and in truth, she simply can’t forget the connection she felt with Scooter, the leader of their rescuers. But as hostilities arise between the local Indians and the white frontiersmen, Abby’s focus turns again to the safety of her son. When the young boy disappears following an attack, Abby disregards propriety and turns not to her fiancé for help, but to Scooter. In the face of unimaginable odds, the pair embarks on a quest to find Abby’s son, a journey that will test their courage and faith as never before . . .
Darryl Harris has been a magazine publisher for more than thirty years. He currently serves as a bishop at BYU- Idaho, and previously presided over the Korea Seoul Mission. He lives in Idaho Falls, ID. 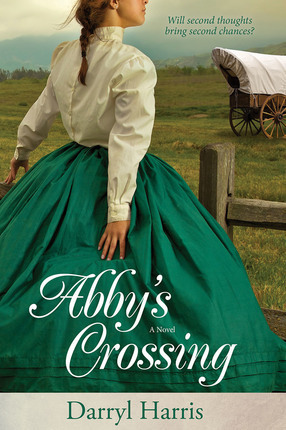 I reviewed “Abby’s Crossing,” by Darryl Harris. This story is about a young widow who accepts a proposal to a man twice her age, out of obligation to provide a secure future for her child. However, she feels a connection to a freighter named Scooter, who isn’t a member of the church, yet comes to Abby’s aid when her son disappears following the Battle of Bear River. I enjoyed reading this exciting book. It has a combination of history, romance, religion and suspense all wrapped into one story. The characters came to life as the story continued through challenges they embarked. Being a mom helped me to relate to the character of Abby, since she only wanted what was best for her son and was willing to sacrifice everything to be a good mother. The quest to find her son tests her courage and faith, which kept me wondering what I would do in her situation. I recommend this fun historical novel to those out there who love to read novels that they won’t be able to put down!